I have probably just done the wrong thing... I have just dug up ALL my potatoes. 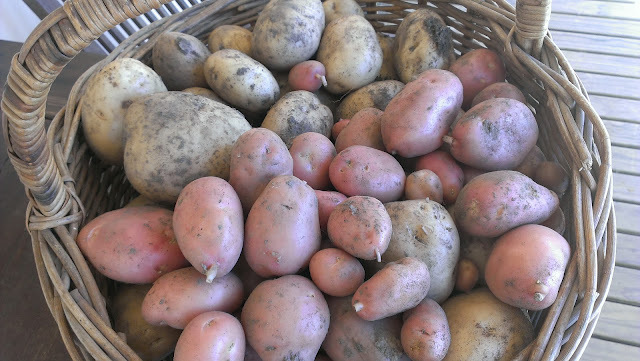 I got carried away, you see, I didn't think I would have a potato harvest at all and when I discovered that there were indeed potatoes under the frost-abused plants I couldn't stop digging them up. 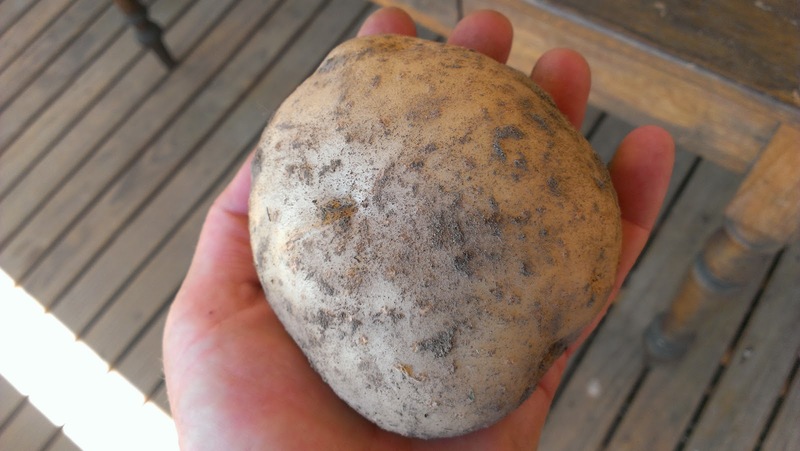 It is possible that digging potatoes is the most exciting type of vegetable garden harvesting... is there a greater pleasure in the patch? I don't really remember when I planted my potatoes - I really should note these things! But the happily growing plants were pretty severely attacked by a very late frost and the plants stopped thriving. Over the last couple of weeks the plants have looked pretty pathetic and I was anticipating that the potato bed would yield nothing. Yesterday I mentioned my pathetic potatoes to my neighbour 'Woody' who happens to have the BEST vegetable patch in the area (probably in southern NSW!). Understated as always as very good vegetable gardeners often are, he said, "have you thought of having a scratch around to see if there is anything there?" 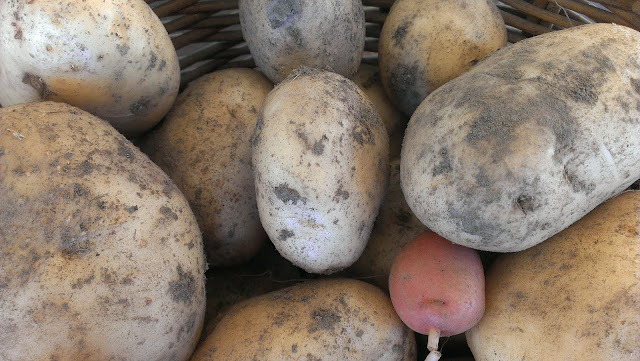 I really shouldn't have dug them all up, potatoes keep much better in the ground but I was so delighted at the unexpected crop that I couldn't stop myself. 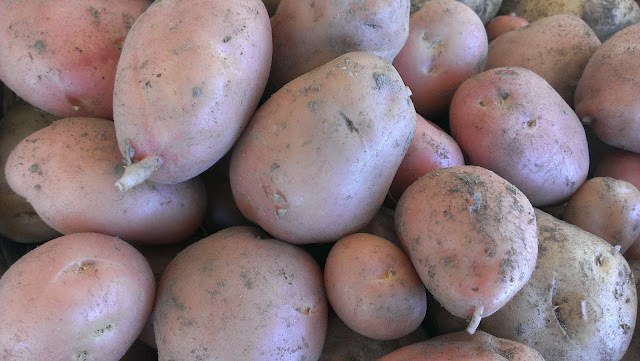 Now I have many more potatoes that I can eat. Oh well there could be worse problems. I know what we are eating tonight. Well done! That is a mighty fine crop, especially as you weren't expecting it. I bandicooted some potatoes for dinner yesterday, too. Boy were they good. I'll leave the plants for a little longer as they aren't dying back yet and should give a better crop, soon. Your potatoes should store well in a cool, dark place. One year when I dug up my whole crop, I kept them in a cardboard box with straw in between so they weren't touching and to keep them dry. They lasted really well. You've got leeks, I think? Maybe put potato and leek soup on the menu? Oh, and I have late cauliflowers! And they look amazing - just like 'real' ones. I was close to pulling them out, thinking they wouldn't come to anything so I'm glad I waited. I don't have a glut like you did but I'm pleased, just the same. We are eating the damaged ones ( you know - the ones damaged by the probing fork!) tonight in one of my favourite salads - a Jill Duplex one - Warm Potato and Tuna salad. Thanks for the storage tip! I am wavering between storage and setting up my first roadside stall! Very nice. I do love a surprise harvest. I would have dug them all up as well. But I find no matter how thoroughly I think I have combed the bed, I always miss some and get potato plants coming up again. I have been very lazy with documenting plantings, though I am getting better at labelling plants and seeds I've put down, cos I felt so silly blogging and saying I had no idea what variety (insert plant here) is. But I'm sure I'll miss something and have to say it again. I too love potato digging so much that I can rarely stop at just a few. Your crop looks great. 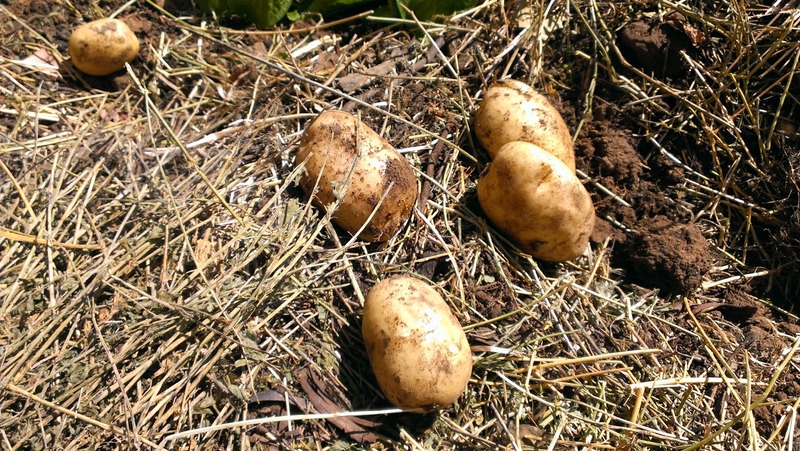 I have been eyeing off the potato plants in the corner of my yard hoping they'll start to die back as I'm really keen to see what's underneath - hope its half as good as yours.